An escape of water claim might not have the same emotional impact as a loss resulting from a fire or a burglary, but from an insurance industry perspective, these types of claim are a major concern. 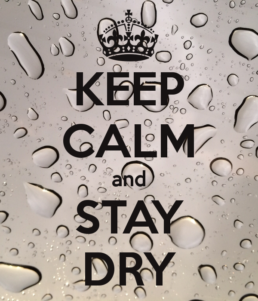 Figures from the Association of British Insurers (ABI) show that its members pay out around £2.5m every day for escape of water claims (in residential buildings) and this cost is rising. The latest ABI figures show that, in 2017, domestic escape of water claims cost 24% more than 2014. Worried about your business? 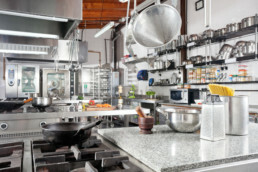 You can expect more costly damages to occur. Compared to the average cost of residential claims (£2,638), the average cost of each commercial claim is roughly £4,000! What’s more, on average, you will lose £1,700 each claim due to paying for excess and/or lack of insurance cover. Taking into consideration the different ways we use water around our homes (under floor heating, en-suites, wet rooms) and the reduction is using copper pipes in the plumbing industry. You can only react when you have actually noticed the leak in the first place. What if the leak starts whilst you are away on vacation? The amount of damage a property would sustain from escaping water will dramatically increase the longer it’s not addressed. 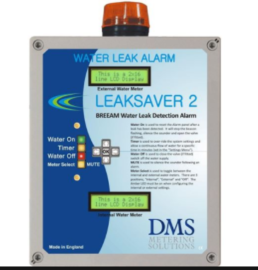 Naturally there is a solution to every issue, Leak detection devices are available to alert property owners to an escape of water and, in many instances, shut off the supply of water. Flow-based technology is widely used. This analyses how much water is flowing through the system, with many devices triggering an alarm, sending an alert and shutting down the supply if the flow deviates from what’s expected. Are you for Traditional or Internet-Enabled? 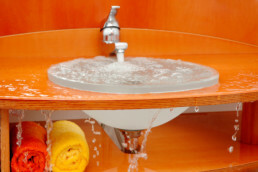 Products for detecting leaks can be split into 2 categories, traditional and internet-enabled. Internet connectivity is a major benefit for leak detection because customers can receive remote alerts to their mobile device wherever they may be, and more advanced diagnostics can be used. With the development of intelligence and pattern recognition, a user’s unique water usage profile can be learnt, which means alerts are bespoke to each building/floor/room. For internet-enabled devices, an online app gives the user flow visualisation, so they are able to see the water usage before the leak occurred in order to understand exactly what happened. Sometimes it is difficult to know where a leak might be, so splitting the building up into zones can offer a great deal of insight more than single zoned variants. Keep up the pace with realtime monitoring which will give immediate alerts and feedback on usage, especially useful in time-critical environments or simply to test the that water saving tap/shower you just installed! What about AMR or BMS? 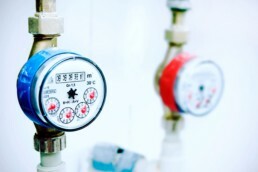 If you have a large commercial site, you may have a Building Management System (BMS) with the ability to read water meters. Or you may have a datalogger connected to your water meter giving you Automatic Meter Readings (AMR). These tools are great for supplying monthly billing information, but infrequent readings and unsophisticated software means customers often suffer from data overload before being able to spot leaks. The data is time consuming to sift through and does not immediately give any useful insight. Because the data often comes from a revenue meter supplying the whole building (or multiple buildings), it is even more difficult to understand where exactly your water is going. Furthermore, BMS and AMR do not shut the water off automatically, so you are still prone to significant damages from a catastrophic leak before anyone can get onsite and find the stop tap. That’s assuming the stop tap still works! Now you know what you need to survive a water leak! Where can you go from here? Well look no further, we have listed all of the known products available in the UK and compared their main benefits allowing you to see which device would be right for you and would give you the peace of mind you have everything under control. 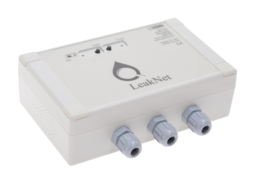 Using state-of-the-art smart metering technology, LeakNet enables internet connectivity for up to 4 water meters, 30 temperature sensors, and 1 valve. By using the latest in WiFi technology, high resolution data is obtained frequently and reliably. Real-time data analytics are used in the cloud to detect anomalies and diagnose faults. Our dynamic web dashboards allow users to monitor their water usage in real time and engage more with their water consumption habits. Email and phone alerts allow users to be notified as soon as they have a leak, giving them the chance to turn their water off from anywhere in the world and avoid serious water damage, whilst also saving otherwise wasted water. When abnormal water consumption is detected in exposed or unexposed areas, day or night, within or outside the property, Flowless immediately sends an alert, and can automatically shut down the central water tap. GROHE Sense and Sense Guard offer a complete leak detection/water security system that monitors temperature and humidity to alert you of the tiniest leaks, all via the GROHE ONDUS app. And with Sense Guard, you can also shut off your water supply automatically in case of detected leaks, or even remotely when traveling, giving you total control of leaks and flood damage in your home. LeakBot’s patented Thermi-Q technology accurately measures both the air and water temperatures in your home. If you have a leak it will continually draw colder water from outside into your home, creating a consistent drop in your water temperature. 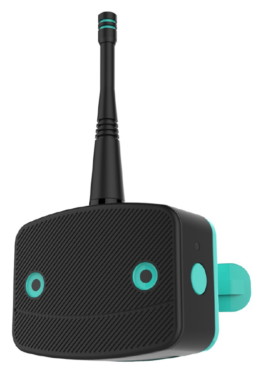 LeakBot can sense the prolonged and consistent drop in temperature and alerts you to the problem. The device is easy to fit over a pipe, but cannot turn the water off. The LeakSaver Panels are designed to work alongside their range of Water Meters in order to detect possible leaks in a system and create a more efficient supply of water into properties. 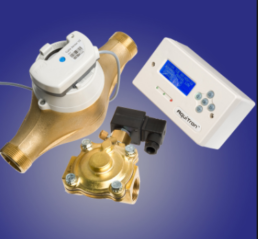 By utilising either a single Pulsed Input on the LeakSaver 1 or two separate Pulsed Inputs for the LeakSaver 2, the amount of water that has passed is monitored over set periods of time. Should the volume surpass pre-set flow limits then the alarm will trigger both visually and through an audio output and the source of the possible leak can be picked up on much earlier than if the system was not present. 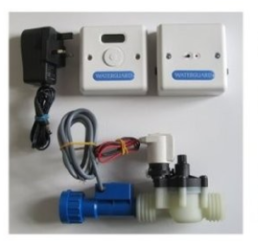 The LeakSaver units are 230vac mains powered or a 12v Battery can be supplied to power the unit internally. The LeakSavers also have Pulsed Outputs in order to relay the Water Meter data further to BMS Systems or other data logging facility. Water shut off system to turn water off when the property is unoccupied. 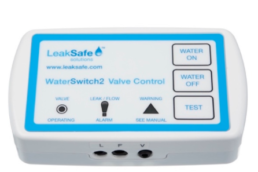 Install a Leaksafe WRAS approved motorised ball valve and Valve Control on the incoming water mains, and a wireless on/off switch by the main entry/exit point and turn the water off each time you leave the property. Turning off the water is as easy as turning off a light. * Additional products need to be purchased for this feature. 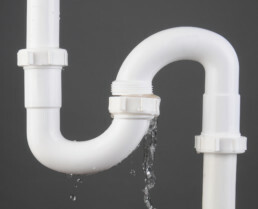 The Waterguard Home system protects your property by timing the water flowing through your pipes. Each time you stop running the water, the time is reset to zero. The user sets the maximum time of continuous water flow allowed when the property is occupied. This is known as Low Guard and ranges from 1 – 40 minutes. And the same for when the property is unoccupied, known as High Guard which ranges from 0.1 – 5 minutes. 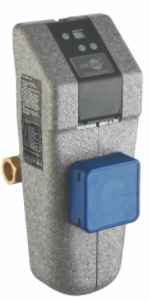 If the maximum time is exceeded on either guard level, the stop valve is automatically activated to shut off the water supply, protecting your property from the damage caused by burst and leaking pies. The Floodcheck ‘Auto’ valve is a water leak detection/prevention device which minimises internal water damage and protects a property from internal flooding, by monitoring the water supply 24 hours a day, 365 days a year. 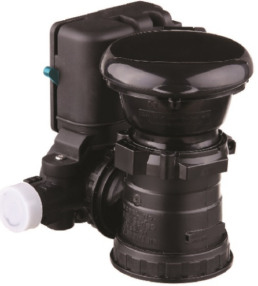 The Floodcheck ‘Auto’ valve can be purchased on its own or with optional extras like the ‘Water Control Switch’ and ‘Wetpads’, both of which are designed to work with and further enhance the product. (See below for details). The Floodcheck ‘Auto’ valve is available in UK and EU 15mm & 22mm fittings as well as USA 1/2″ and 3/4″ sizes. * Please note: the previous descriptions were taken from the relevant manufacturer’s websites.